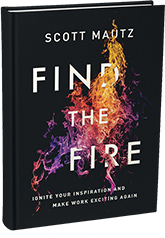 Scott is a skilled trainer as passionate about teaching and in-depth skill building as he is about speaking from stage. He blends his decades of top-notch business experience, vast research, passionate storytelling, and knowledge of adult learning principles to create one-of-a-kind experiential workshops. In this half to full-day workshop (can be tailored in length), participants learn the art & science of becoming a “once-in-a lifetime” coach to their employees. Attendees will learn about The Coaching Mindset (how the best coaches in the world approach coaching) and how to have powerful Coaching Conversations (including how to structure them and how to pinpoint opportunities and excel at giving feedback – even to difficult employees). They’ll also learn how to remove the most common barriers to an employee’s personal growth. Attendees will stay deeply engaged and learning through exercises, discussions, videos, music, story-telling, tools, sharing of experiences, and more. Coaches will leave inspired, informed, and prepared to apply their new found, elevated coaching skill set to their existing coachee partnerships. They’ll also walk away with many powerful tools to use in their day to day coaching. Results and relationships are both sure to soar. This unique, day-long training (can be tailored in length) focuses on teaching leaders one of the most critical skills they can have – motivating employees to peak performance – in a manner that sustains. Leaders are taught The 7 Markers of Meaning – specific conditions the leader can foster that create meaning in and at work (Work that matters, learning and personal growth, competency and self-esteem, autonomy, and an environment of caring/teamwork/authenticity feeling confidence in leadership and the mission, and cutting off corrosive behaviors). Leaders then learn about The Footprints of Legacy – the manners by which social science teaches us we tend to leave a lasting impact behind, whether or not we realize it. If we are made aware of the “buckets” of ways in which we can leave footprints, then we can begin working to fill each bucket, even if just a little, every day. The group then learns about The Footpath to Legacy-worthy Results – the specific steps one can take to maximize the fulfilling legacy left behind via meaningful results at work. The training uses a combination of keynote, group discussion, individual contemplation, and killer exercises/tools to ingrain the content and keep the momentum going long afterwards. This comprehensive, 2-3 day leadership training teaches the 3E model of leadership (Energize, Envision, Enable) – a proven model used by companies known for grooming world-class leaders. Teaches leaders how to energize the troops in the most sustainable way possible (by fostering meaning). Also teaches leaders Self-Leadership, or how to fully reignite one’s own passion for work – thus putting the leader in a better position to energize others. Teaches leaders how to craft a compelling vision, powerful supporting goals, and an inspiring personal vision – a legacy. Teaches leaders how to fully enable and expertly coach their employees. The training will transform leaders into the coaches they always wish they had. This themed, complete program lasers in on producing leaders that are inspired and that are skilled at inspiring their employees. The curriculum combines keynotes, workshops, video course instruction, and follow-up 1 on 1 coaching into a comprehensive and integrated masterclass on producing inspired/inspiring leaders. Inquire about a separate, detailed plan for this offering. The workshop includes a walkthrough of all the tools being made available to help create meaning in/at work. This 45-minute workshop is designed to accompany/immediately follow the Keynote of the same name. In this workshop, attendees are introduced to The Innerview – an introspective set of questions designed to help the participant craft a legacy statement. After the questions are introduced, the attendee is given quiet, reflective time (the bulk of the workshop) to write responses to the questions. They’re then given the option to share their legacy statements with the group at the end of the workshop. This 45-minute to half-day workshop is designed to accompany/immediately follow the Keynote of the same name. In this workshop, audience members engage in a series of exercises and are given a number of tools to help address each of the most common and caustic of the 9 Anti-Muses (the forces that drain our inspiration at work and in life).